Tomorrowland Terrace is a counter-service fast-food restaurant. It doesn't just offer food though—there's also an indoor stage that features live bands and shows (or used to anyway—I'm not exactly sure if they still do). The menu here includes hamburgers, cheeseburgers, a teriyaki chicken burger, and a roast beef sandwich. But my favorite thing on the menu is listed with the side dishes: almond fried chicken strips. You can also get French fries, salads, cream of corn soup, and chocolate cake. 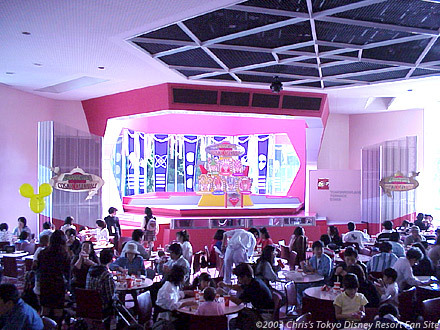 The Tomorrowland Terrace has the largest seating capacity of any restaurant at Tokyo Disneyland: 1229 seats in all, divided into several sections. Unfortunately, the seating area where the stage is located is the smallest, and consequently the hardest place to find a seat.